Highly popular Winchester food blogger - Baked by Lexi shares one of her favourite dinner party chocolate desserts. I remember the first time I made this dessert. I made it very last minute for a dinner party at my friend’s house. My friend, Alice, was leaving the country and relocating to New Zealand indefinitely and she’d decided to throw a dinner party for about 14 people, on short notice. Ah! As soon as I heard ‘Do you want to come to a dinner party tonight?’ I immediately thought about dessert. (I have a super sweet tooth as you can tell!) With little time to prep, dessert hadn’t even been considered. So, naturally, I offered to bring one. And with baking in my bones, I couldn’t bring a shop-bought one, could I? Without a clue what to make, and slight panic about providing a dessert for so many people, I scoured the internet for something most people would like..chocolate is always the answer. So I headed straight to Nigella’s website. I’ve watched her cooking programmes countless amounts of times and tried and tested many of her recipes. And honestly, when following her recipes, it’s never gone wrong. 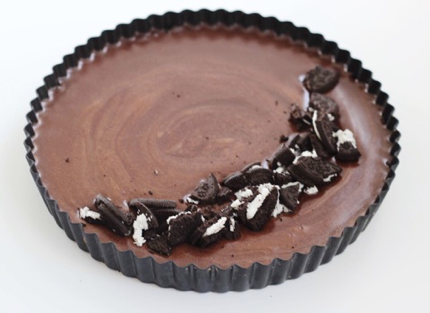 So when I saw the recipe for ‘Salted Chocolate Oreo Tart’ I knew instantly I was onto a winner! How had I not seen this before? And it tastes like pure comfort. It’s sumptuous, easy to make, and totally perfect for chocoholics (most of my girlfriends). Anyone who doesn’t love this, please let me know. I think I’d fall of my chair backwards with shock, if you told me you didn’t! So I took it to the party. I hadn’t tried it myself until it was served up, so I was nervous. But honestly, there was a split second of silence when everyone tucked in. The sort of silence when kids finally get to eat the cake at the party! The base was crumbly and thick with bursts of salted dark chocolate and coupled alongside the chocolatey, velvety cream filling. Have you got a dinner party coming up, or you’ve nominated yourself to bring the dessert? If you do, please give this one a go. I promise, you will not look back! 1. Chop the chocolate into small pieces and break the Oreo cookies. Add both to a food processor and blitz. Then add the butter and salt, and continue blitzing until the butter has all mixed in. 2. Tip the mixture (soil as I like to call it) into a tart dish (loose bottomed-flat tin, 23cm) and press down with a spoon. Ensure the mix is evenly spread across the tin, and it’s nice and smooth. 3. Once finished, put this into the fridge for at least an hour to harden and chill. 1. Chop the chocolate quite fine. In a bowl, whisk the cornflour and milk together. Set this aside. 2. Pour the cream into a large saucepan (a deep saucepan) then add the chocolate. Make sure your hob is on a low heat, as you don’t want it to bubble. Next, add the sieved cocoa powder, sea salt, instant coffee powder, sugar, vanilla extract and olive oil. Whisk together the ingredients on the low heat. You will notice the chocolate start to melt and the mix will gently get darker and more chocolatey. Once the chocolate has all melted, take the pan off the heat for a minute and add the cornflour mixture. Stir this in well with a wooden spoon. 3. Put the saucepan back onto the heat and set your timer for 10 minutes. Continuously stir the mixture with your wooden spoon for 8-10 minutes. Make sure the mixture doesn’t boil. If you need to take the pan off the heat for 30 seconds, do. You’ll know when the mix is ready when it is thick enough to cover the back of the wooden spoon. And if you run your finger along the back of the covered spoon, the line should stay. 4. Take the saucepan off the heat, and pour the mixture into a measuring jug. Rip off some baking parchment and scrunch it up. Rinse it under cold water until it’s all soaked well. Drain it a little with your hands and put it on top of the jug of mix. Then put it into the fridge for 15 minutes. This ensures the mix doesn’t form a ‘skin’, and cools down enough for you to be able to pour the mix over the base without melting it. 5. Pour it over the base, and put into the fridge to set. This will need about 4 hours minimum. Once set, add your toppings! Here, I’ve gone for a simple line of crushed Oreos but you could top it with raspberries, strawberries or edible flowers. You name it. For more great recipes, head over to Baked by Lexi's website. Follow her on Instagram and Facebook. Can your smart home technology save you money?